I always thought of myself as a chocolate person. I love chocolate. Given a choice, mine is always chocolate. So I was a bit surprised when I recently realized that I love oatmeal cookies. Not only do I love them, but I have loved them for years and never paid much mind to this (the chocolate clouded my vision). My favorite chocolate chip cookie has oatmeal. I love granola cookies...oatmeal! I love those oatmeal cookies with cream sandwiched between them and, of course, the classic oatmeal raisin cookie. 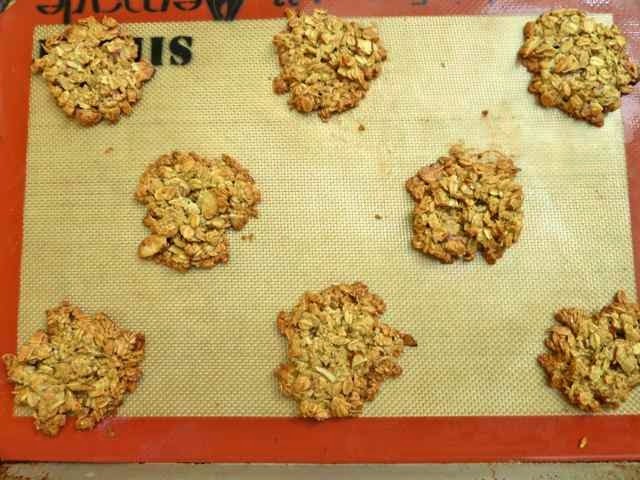 A photo of Martha Stewarts Oatmeal Almond Crisps caught my eye. 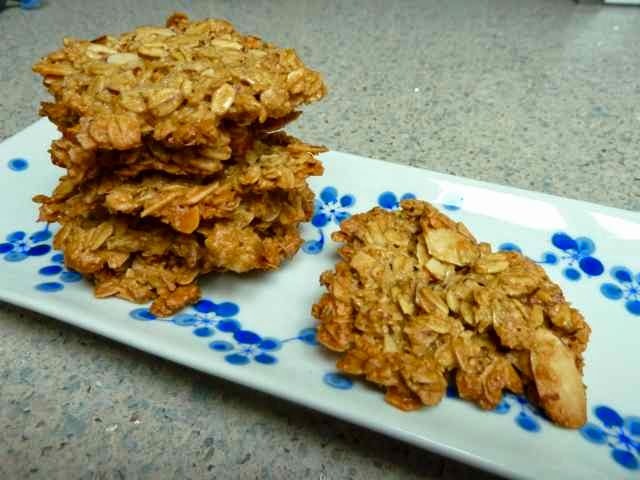 Toasted almonds could only improve the beloved oatmeal cookie. I converted the recipe to gluten free by using certified gf oats and added some xanthan gum and gf oat flour to make a less fragile cookie. I made mine dairy free by replacing the butter with oil so that some dairy free friends could eat them. I love how they came out, crispy on the edges and a bit softer in the center. Almonds and oats are a delicious combination. Very flavorful, they were all eaten up at one gathering with friends. I might try using butter next time just to see if they could possibly get any better. Preheat the oven to 350°. Line two baking sheets with silpat mats or parchment paper. 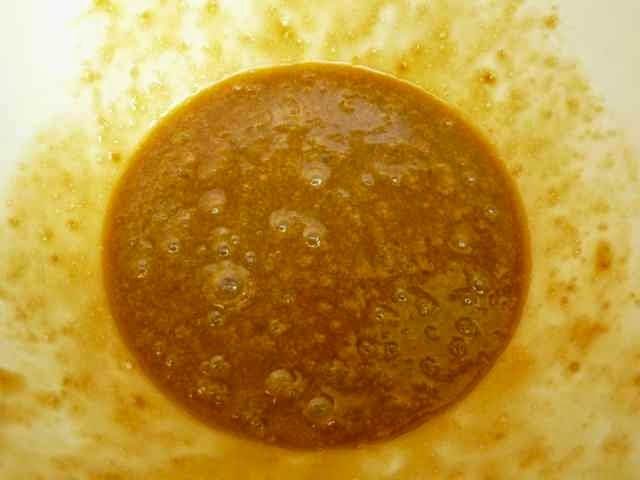 In a large bowl mix the sugar, egg, melted butter or oil and vanilla until smooth. Add the oat flour and xanthan gum and sea salt and mix until well combined. Add the oats and sliced almonds and mix into the dough. Scoop out dough by level tablespoons (a scoop that measures 1½ across works well) 2 inches apart onto the prepared baking sheets. Use wet hands to flatten the cookies into 2½-inch rounds. Tablespoon of dough scooped out on right. Dough flattened with a wet hand on left. Flattened rounds of raw dough on a cookie sheet. Bake until golden brown, about 14-16 minutes. Take care not to burn them. Cool completely on the baking sheets. Gently remove the cookies with a spatula to serve. Baked cookies cooling on the baking sheet. Store in a wax paper lined tin or other airtight container for several days. Freeze cookies for longer storage. 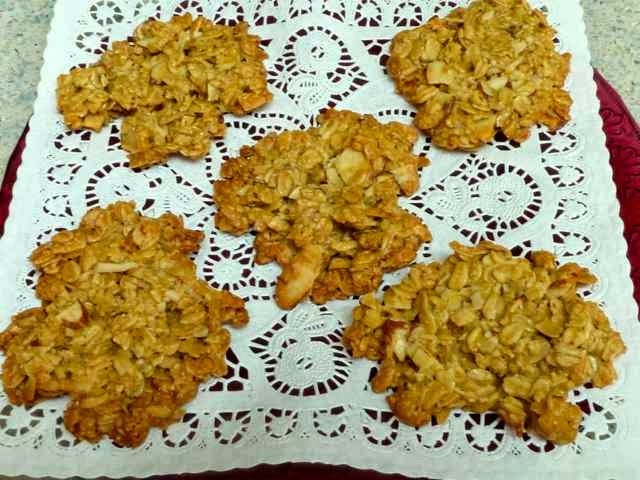 GLUTEN FREE OAT & ALMOND COOKIES Makes about 20 2½ inch cookies Ingredients 1/3 cup Light Brown Sugar - packed 1/4 cup Unsalted Butter - melted or Oil such as Olive or Canola 1 large Egg 1 tsp. 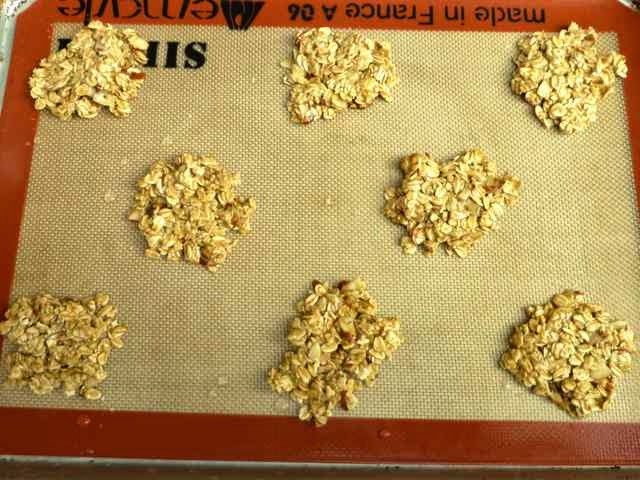 Vanilla Extract 1½ cups Certified GF Old Fashioned Rolled Oats (not quick-cooking) 2 Tbs. Certified GF Oat Flour 1/2 tsp. Xanthan Gum 1/8 tsp. Sea Salt 1/2 cup Sliced Almonds Directions Preheat the oven to 350°. Line two baking sheets with silpat mats or parchment paper. In a large bowl mix the sugar, egg, melted butter or oil and vanilla until smooth. Add the oat flour and xanthan gum and sea salt and mix until well combined. 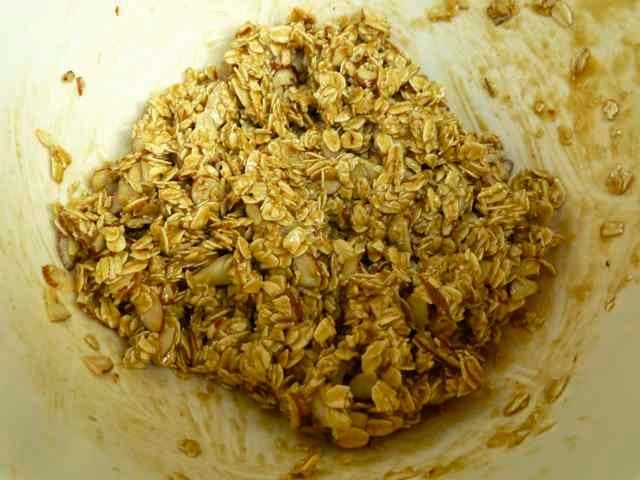 Add the oats and sliced almonds and mix into the dough. Scoop out dough by level tablespoons (a scoop that measures 1½ across works well) 2 inches apart onto the prepared baking sheets. Use wet hands to flatten the cookies into 2½-inch rounds. Bake until golden brown, about 14-16 minutes. Take care not to burn them. Cool completely on the baking sheets. Gently remove the cookies with a spatula to serve. Store in a wax paper lined tin or other airtight container for several days. Freeze cookies for longer storage.